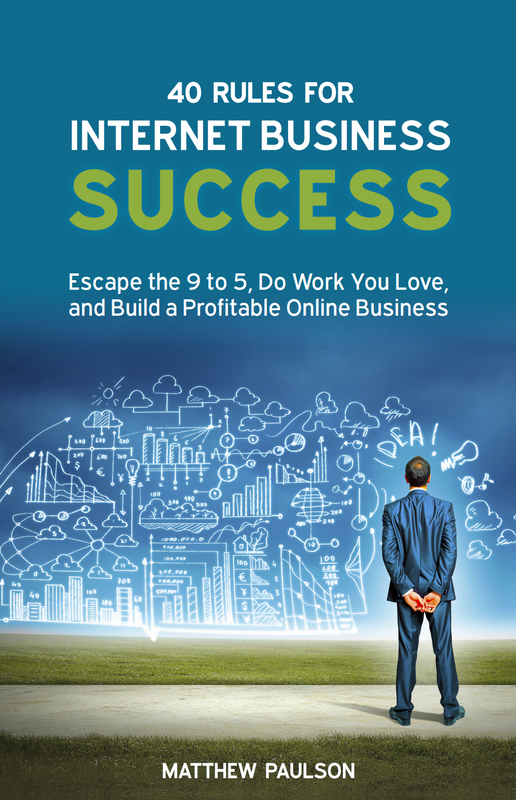 It’s been a month since 40 Rules for Internet Business Success has come out. Now that the launch of the book is in the rear view mirror, I thought it would be a good time to discuss why I wrote the book, the content creation and editing process, how I marketed the book, and some other reflections. I didn’t have a strong business reason to write the book. My various enterprises are not built around my personal brand. Having a book out won’t move the needle for any of my companies, but writing a book gave me an opportunity to share what I’ve learned with others. It gave me an opportunity to learn about the book writing and marketing process. It was also a new challenge. I was looking to do something that I haven’t done before that would take a lot of effort and result in something I can be proud of. Writing a book did just that. I’ll be the first to admit that I knew nothing about book writing when I decided to write 40 Rules for Internet Business Success. In order to expedite the process, I contracted with Andy Traub to be my personal book coach. Andy offers a course called the “Self-Publishing System” and I thought having a successful author tell me exactly what to do and push me along would help ensure I made it through the process and actually finished my book. I also figured that if I was paying Andy a sizable sum of money for his services, I would be motivated not to let those funds go to waste. Hiring a book coach was one of the best decisions I made during the process. I could have done a lot of reading and researching to learn how to do things like hiring an editor, finding a narrator for an audiobook, formatting the book for Kindle, creating a cover, etc. I would have had to read several books about self-publishing and spent about a hundred hours researching the various aspects of self-publishing. Instead, I wrote a check and had an expert guide me through the process. He also lined up an editor, a cover designer, a layout editor, an audiobook narrator and an audiobook editor. I would have never been able to find such high-quality professionals without Andy’s help. Having Andy push me along and guide me sped up the process exponentially. In fact, I was able to write, edit and publish the book in approximately four months. I actually have quite a bit of experience writing. I wrote about 1,500 to 2,000 words per day as a freelance writer during my junior and senior years of college. I was also the editor of my college’s newspaper, The Trojan Times. But still, I thought writing a 40,000-50,000 word non-fiction book would be an impossibly large task. The best way to tackle a large project is to break it down into smaller chunks. I reframed the challenge as writing forty 1,000 word blog posts. Since the concept for the book was a list of rules, it was pretty easy to break the book down into individual topics to write about. I committed to writing at least one chapter every day for forty days and put a lot of other projects on hold to make sure I was able to hit that daily goal. I also made it a point to write as my first work-related task in the morning so that if I got anything done that day, it would be writing that one chapter. After I finished writing the first draft of the book, I sent it over to the editor that made my words sound a lot better than they were initially. She sent back chapters with comments and suggestions for improvements. I made the changes she requested and she folded them back into the master copy that I would then review and approve. The editing process was a lot more work than I initially thought it would be. It’s a really a detail oriented task, but going through the editing process really improved the quality of the book. I also recommend having someone else proof-read the book after it’s been edited. My loving wife Karine stayed up until 2:00 AM one night proof-reading my book and found several issues that needed to be corrected prior to publishing. From the beginning, I knew I wanted to make the book available as a paperback book, a Kindle book and an audiobook. I’m a firm believer that you should be able to consume a book in whatever format works best for you and wanted to make sure that my book is available in every format a person might want. I chose to publish my book exclusively through Amazon, since they are responsible for about 50% of all book sales. There are also some nice promotional perks that you get by giving Amazon the digital exclusive for your book (lookup “KDP Select” for details). The Kindle version was the easiest to produce. It was simply a matter of putting the content into Scrivener in the right order. There were a few complexities with Scrivener I wasn’t expecting, such as issues with paragraph spacing, fonts and bulleted lists. However, I was able to take the completed text of the book and create a finished Kindle .MOBI file in a matter of four hours. The process of submitting a Kindle book is straightforward. It’s a three page form on the Kindle Direct Publishing (KDP) website. The paperback and audiobook versions were slightly more involved. Ellen Jesperson created the cover and the layout for the print version of the book. She did a fantastic job. I simply had to take the files she created and upload them to Amazon’s CreateSpace. CreateSpace sent a proof copy of the book for me to approve and it was live on Amazon soon after. Stu Gray did the narration for the audiobook and Toby Lyles edited the audiobook. The publishing process for an audiobook is a bit slower than the print and Kindle versions. The audiobook version came out a week and a half after the official launch of the book as a result. In order to get some early Amazon reviews of the book live, I sent out a free PDF copy of the book to a number of different friends and acquaintances and asked them to review the book. As a result, I was able to get 15 reviews up for the book within the first couple weeks of the book launch. I used a three pronged approach to market the book. First, I did a virtual book tour and pitched a variety of podcasters about being guests on their shows. I ended up being a guest on about ten different podcasts, including Internet Business Mastery, Niche Pursuits and Chris Locurto’s podcast. You can see the interviews I did on my “interviews” page. This was probably the most effective method of finding readers for the book, since these podcasts already had existing audiences of people that wanted to learn about internet business. Second, I leveraged my existing email lists. I have a list of approximately 100,000 subscribers that receive Analyst Ratings Network’s daily email newsletter and smaller lists associated with GoGo Photo Contest and Lightning Releases. These lists weren’t a perfect fit for the topic of the book, but gave people who are customers of my various business enterprises the opportunity to know about the book. Finally, I ramped up my blogging and tried to be more active on social media. 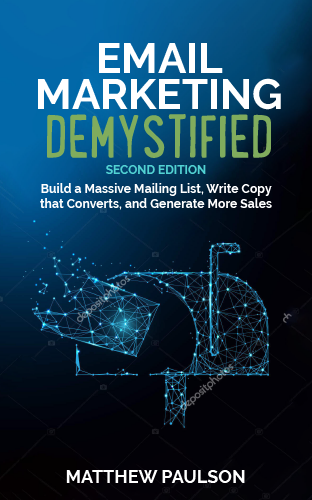 I posted approximately half of the chapters of the book on my personal blog as a way to generate excitement about the book and collect email addresses for the book launched. I also did a “promoted account” advertising on campaign Twitter, but it’s hard to say how effective it was. 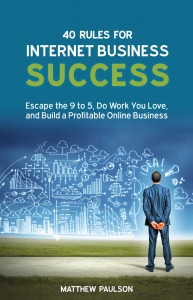 Going into the process, I really didn’t have any expectations 40 Rules for Internet Business Success. I really didn’t know what work would be involved to get a book out the door. I had no idea how many copies it would sell, what kind of traction it would get or how it might impact my personal brand. The book sold about as many copies as a first-time self-published author could expect. It wasn’t a big financial success, but it wasn’t a big financial failure either. 40 Rules for Internet Business Success was a huge shot in the arm for my personal brand. I’ve been interviewed on podcasts I’ve never thought I would make it on to. I’ve received a few dozen emails from people first heard about me through the book or were helped by the book. My marketing efforts have tripled the amount of traffic my personal blog gets on a monthly basis. I couldn’t be happier with how the book has impacted my personal brand. There’s a lot I didn’t know going into writing my first book, but it was a fun and challenging process. Nice job, Matt! I'm proud of you! This couldn't have been an easy process, and it takes someone with dedication, commitment, and vision to complete such a task.